Los Angeles Chargers - Blue NFL Laser Tag / Mirror License Plate. 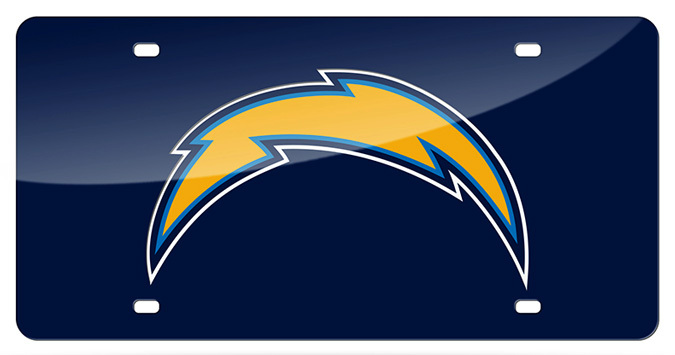 Officially licensed NFL 6" x 12" acrylic mirror license plate with Los Angeles Chargers team logo laser engraved in the center. San Diego Chargers / Qualcomm Stadium Framed and Matted NFL Panoramic Photograph. The panorama photo is of Qualcomm Stadium in San Diego, home of the San Diego Chargers, during a game (Kick Off) against the Denver Broncos. The deluxe panorama features black double matting and your choice of black or cherry frame, with a 1" x 4" engraved brass nameplate. Actual size is 40" x 14"